The biggest annual coin show in the Pacific Northwest, sponsored by the Pacific Northwest Numismatic Association (PNNA) and now in its 14th year in Tukwila, was once again a big success, with strong attendance despite widely variable weather conditions ... warm Friday and cooler and rather wet Saturday and Sunday. Total three-day paid attendance was approximately 1,000. See the convention program with dealer list (PDF file). In addition to bourse activity, there were exhibits, awards, numismatic theater and club meetings on Saturday, and a popular Young Numismatists (YN) program. Some of the speakers and award winners are pictured below. Juniors on the bourse floor were excited to have the opportunity to complete a set of numismatic items as part of the Young Numismatist (YN) "Treasure Hunt" game. Participation was excellent as always, with the program once again conducted this year by ANA President Walt Ostromecki. A Boy Scout workshop was conducted on Saturday by James Reinders. There were eight collector exhibits this year in 22 cases, the best turnout in years! "Squished" or elongated cents were available as souvenirs, thanks to the PNNA's popular machine! Sales began of the 2015 Portland ANA National Money Show commemorative medals. See the 3rd Quarter 2014 issue of The Nor'wester for board and general membership meeting minutes. Special thanks to Kevin Charboneau for serving as general chairman for the 2014 convention. This was Kevin's first convention as chairman, and he did a nice job. The PNNA is pleased to announce that the association's annual convention will again be held at the Tukwila Community Center, May 1-3, 2015. 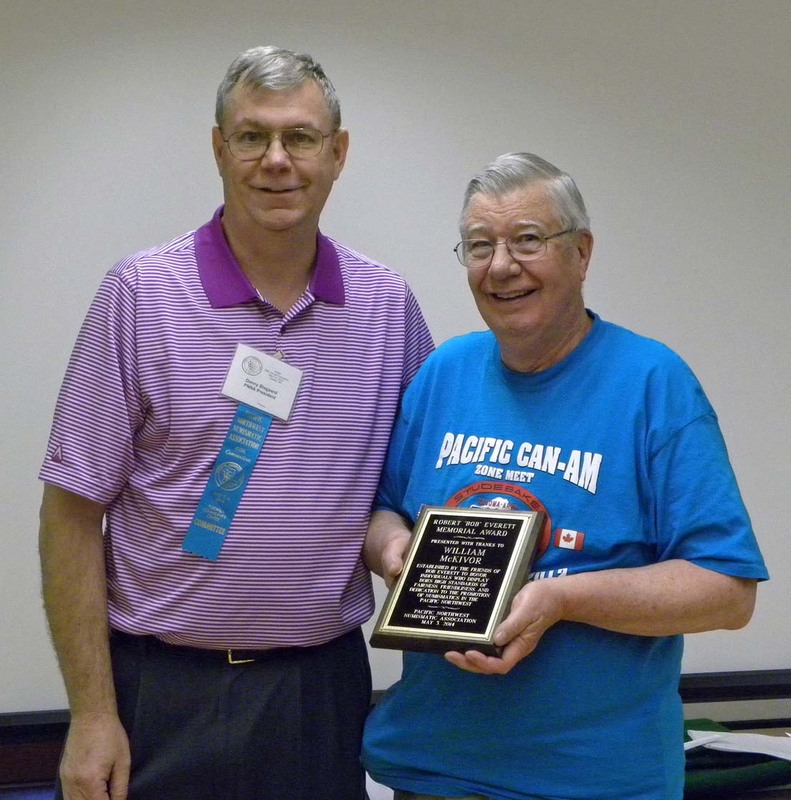 Bill McKivor (right), longtime PNNA Director and British token and medal dealer (among other activities), received the Bob Everett Memorial Award from PNNA president and award committee chairman Danny Bisgaard (left). 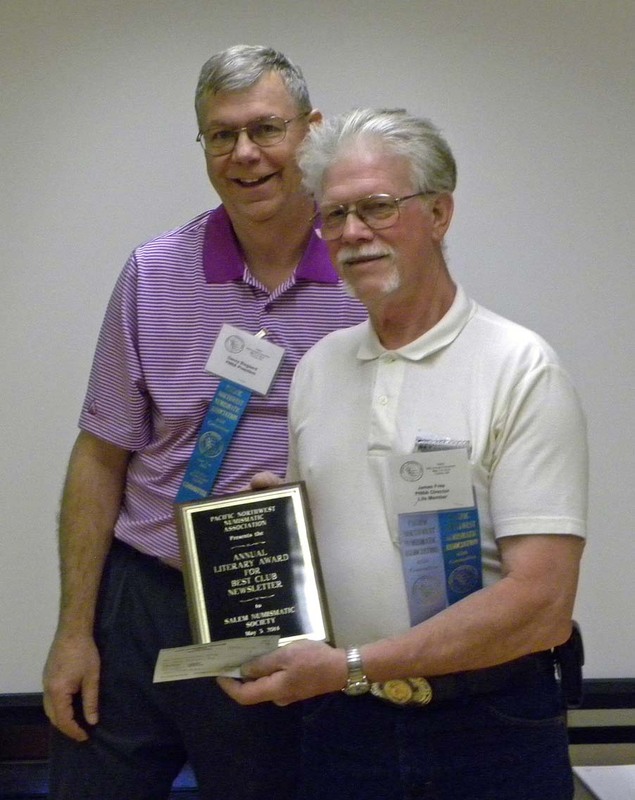 James Free (right), Salem Numismatic Society president and new PNNA board member, received the Nina Nystrom Memorial Goodwill Ambassador Award from PNNA president and award committee chairman Danny Bisgaard (left). 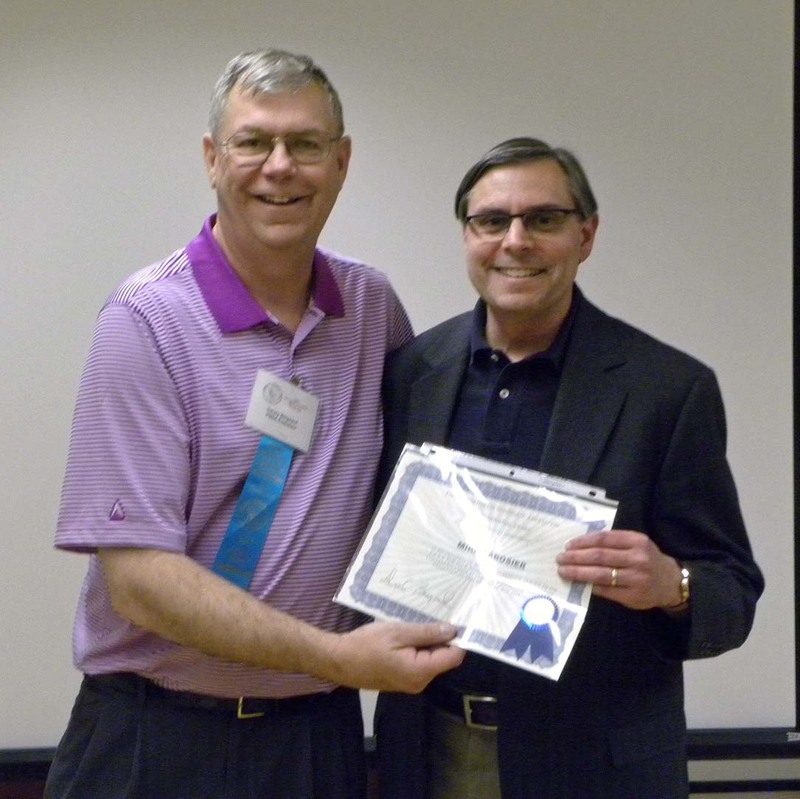 Mike Labosier (right) received a PNNA Presidential Award from Danny Bisgaard (left). Mike just stepped down from his position as PNNA board member and secretary. 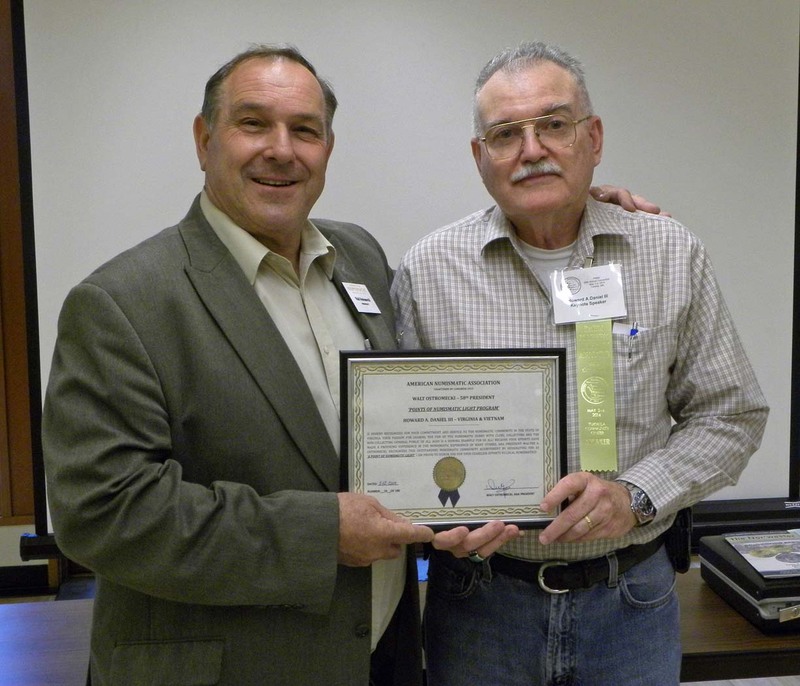 Rick Schulz (left), PNNA board member, Puyallup Fair coordinator and designated "penny squisher," received a PNNA Presidential Award from Danny Bisgaard (right). 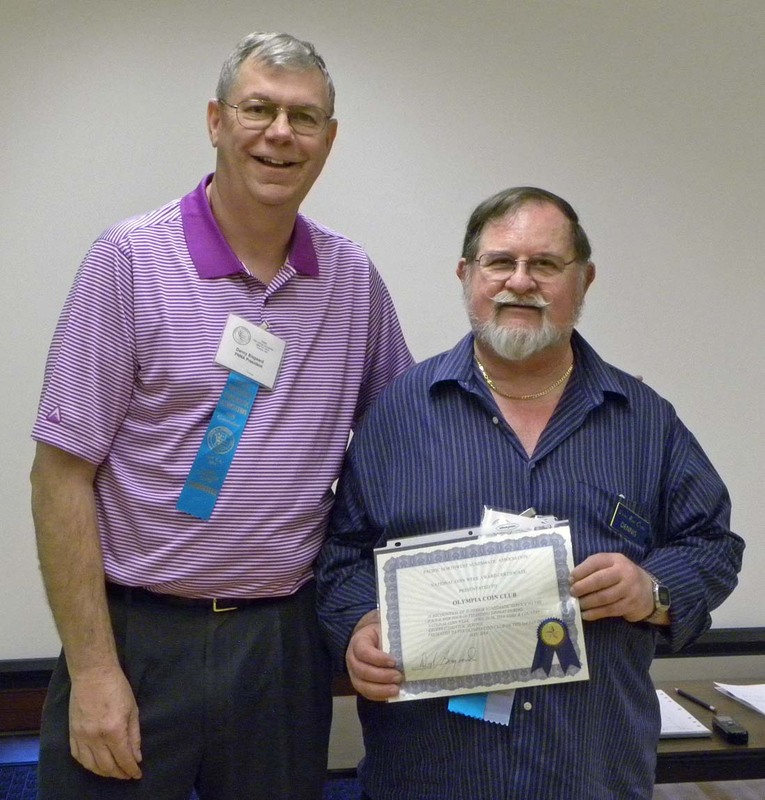 James Free (right) accepted the PNNA's literary award for best club newsletter on behalf of the Salem Numismatic Society. Presenting the award is PNNA President Danny Bisgaard (left). 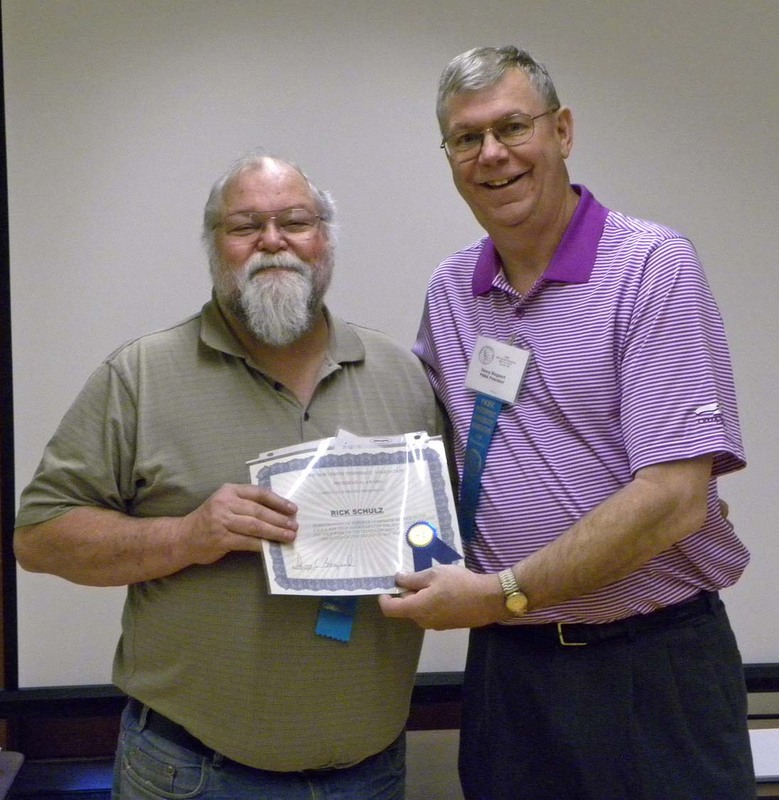 Ron Engholm (right), Salem Numismatic Society member and new PNNA board member, received a 2nd place literary award for an article in The Nor'wester from PNNA president Danny Bisgaard (left). 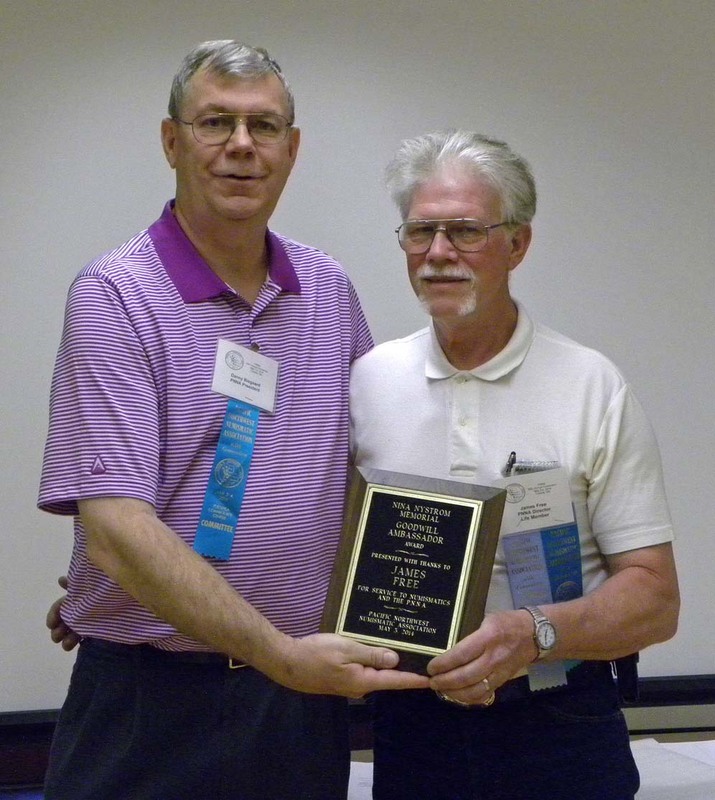 Dennis Reed (right) accepted the PNNA's National Coin Week award on behalf of the Olympia Coin Club. Presenting the award is PNNA President Danny Bisgaard (left). This year's keynote speaker was Howard A. Daniel III. Howard is the author of the Lao Coins and Currency catalog (which he's holding in the photo), and spoke about this topic. 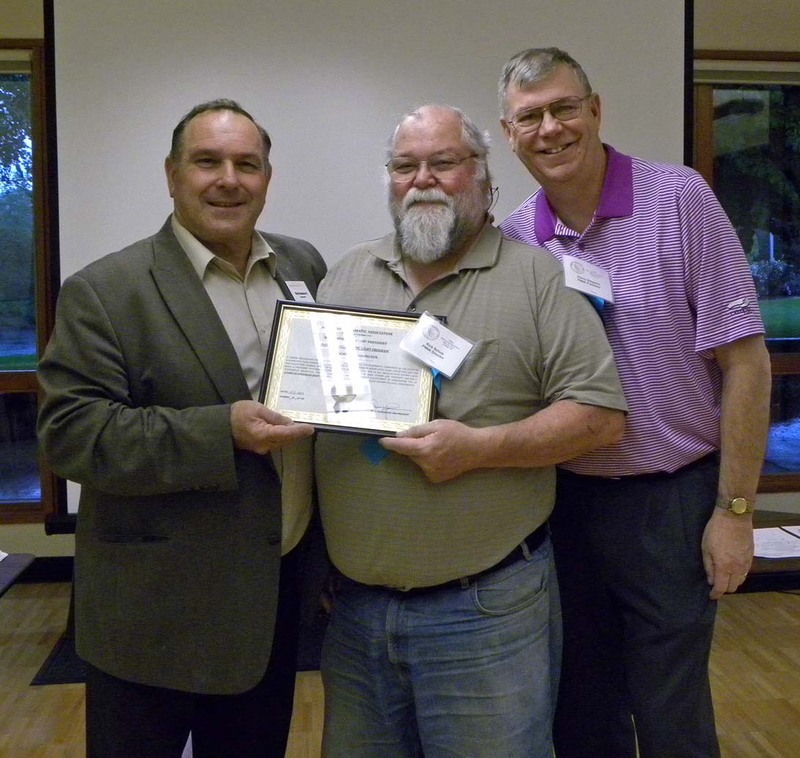 Dennis Reed (center), active Olympia Coin Club member (among other activities) received an ANA Presidential Award from ANA President Walt Ostromecki (left), with PNNA President Danny Bisgaard watching. Mark Gruner (center), active Idaho numismatist, received an ANA Presidential Award from ANA President Walt Ostromecki (left), with PNNA President Danny Bisgaard watching. Mark's wife is at the right. Howard A. Daniel III (right, see above) received an ANA "Point of Numismatic Light" award from ANA President Walt Ostromecki (left). Rick Schulz (center, also see above) received an ANA "Point of Numismatic Light" award from ANA President Walt Ostromecki (left), with PNNA President Danny Bisgaard watching. “We shattered all previous attendance figures at this year’s convention,” hailed first-year PNNA Show General Chairman, Kevin Charboneau. “And that’s in addition to ‘the wow effect’ of our bustling bourse, ANACS submissions and educational outreach programs provided to visitors and hobbyists inside despite three days of rain showers,” he continued. Attendance figures topped the 1,000 mark during the convention held May 2-4, 2014 at the Tukwila Community Center just outside the Seattle city limits. The 85 table sold-out bourse, with a waiting list, offered attendees a wide selection of numismatic treasures in all price ranges. The event also offered a Kid’s Zone activities booth and treasure hunt hosted by ANA President Walt Ostromecki and a BSA coin collecting merit badge clinic given by PNNA VP, James Reinders. Bourse Chairman, Scott Loos, a bourse dealer himself, said, "the bourse was hot, hot, hot! Dealers on the whole were upbeat and well-pleased with the buying public. We had 18 out-of-state dealers from all parts of the nation in attendance this year -- six for the first time!” What was hot? Morgan dollars, medium and high grade U.S. and foreign paper money, Canadian Maple Leaves and mid-grade U.S. type coins. Saturday offered convention goers a variety of informative educational forums, club meetings and 22 cases of world-class competitive exhibits. 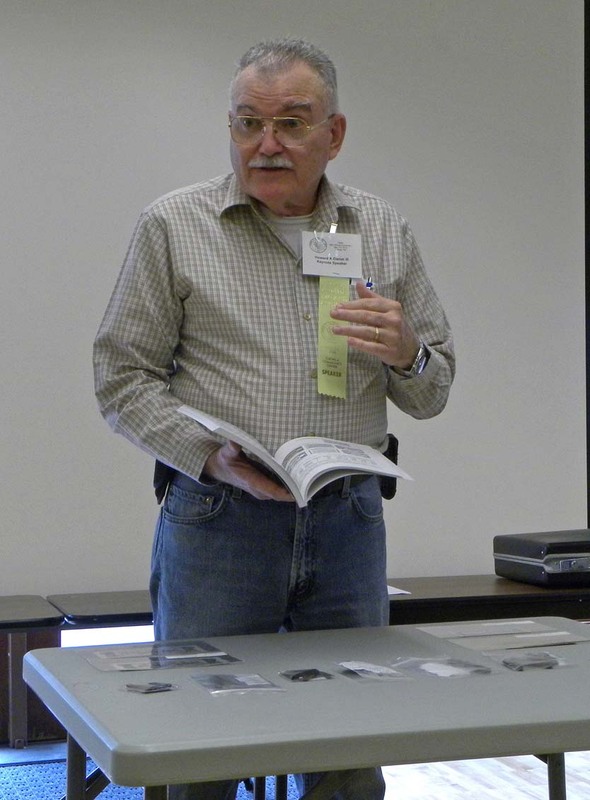 The Numismatic Theater presentations kicked off at 11 a.m. with Mike Zagorin speaking on ‘History and Collecting the Blue Book.’ His talk was followed by a meeting of the Colonial Coin Collector’s Club (C4) meeting hosted by Buell Ish. Keynote speaker and avid Southeast Asia paper money collector, writer and researcher, Howard Daniel III from Virginia, wowed attendees by sharing his latest endeavor of love, Lao Coins and Currency Catalog. A Pacific Asian Numismatist meeting followed Mr. Daniel’s talk. 2:30 p.m. saw Tim Ziebarth speak about ‘US Coinage of the Philippines.’ At 5 p.m., PNNA Chief Exhibit Judge Eric Holcomb held an exhibitors and judges forum. PNNA President Danny Bisgaard opened the 6:15 p.m. general membership and new officer installation and association awards meeting. First up on the docket were the exhibit awards. Chief Judge Eric Holcomb and Exhibit Chairman Dan Vornbrock handled the awards presentations. (See the exhibit awards page.) Election chairman Bill McKivor announced the results of the 2014-2016 officer election: President, Danny Bisgaard; VP, James Reinders; Secretary, John Brown; Treasurer, Scott Loos; Board of Directors: Kevin Charboneau, Ron Engholm, Ed Fischer, James Free, Mark Gruner, Tony Kalt, Gawin O’Conner, Dennis Reed, Rick Schulz and Dan Vornbrock. The group was declared installed by President Bisgaard. “The Association is looking forward to celebrating its 75th Anniversary milestone next year as well as hosting in March 2015 the ANA National Money Show in Portland, Oregon,” noted PNNA President Bisgaard. He showed off the proposed PNNA 75th medal design and the hot-off-the-press two-medal set for the ANA event. He presented a medal set for the ANA’s archives to President Ostromecki. Bisgaard also thanked the Boeing Employees’ Coin Club for providing their assistance in assembling the youth treasure hunt coin give-a-ways. He announced that the Olympia Coin Club (Olympia, Wash.) was this year’s winner of the PNNA-ANA National Coin Week honors and that adult Scott McClaine (Astoria, Ore.) and YN Ermin Chow (Edmonton, Alberta, Canada) were the recipients of the PNNA's scholarships to attend the ANA 2014 Summer Seminar. 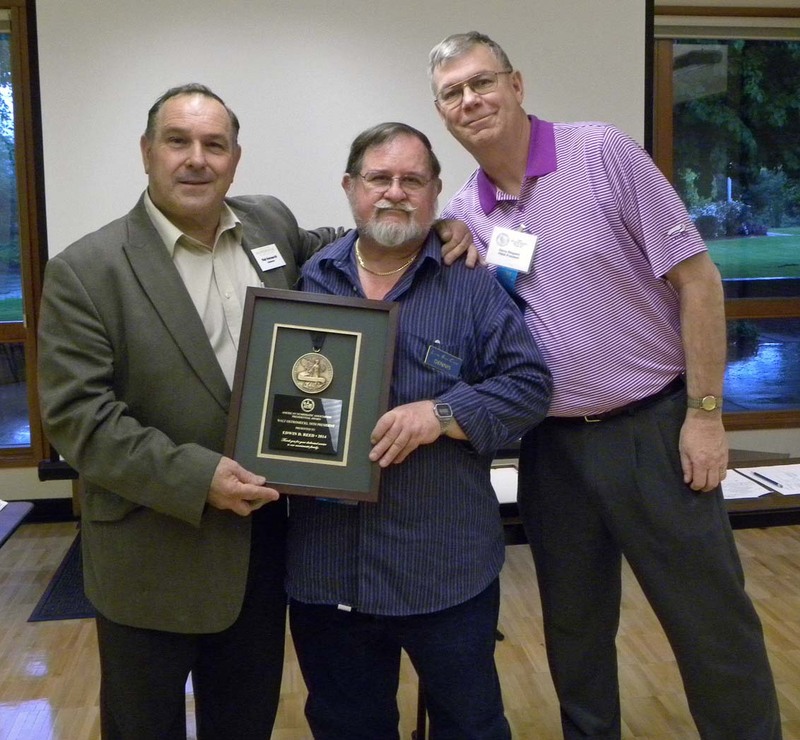 PNNA Presidential Awards went to: Mike Labosier, retiring PNNA Secretary and General Chairman of the PNNA Tukwila show for several years; and Rick Schulz, Puyallup Fair coordinator, penny ‘squisher’ and manager of the PNNA's new traveling display. 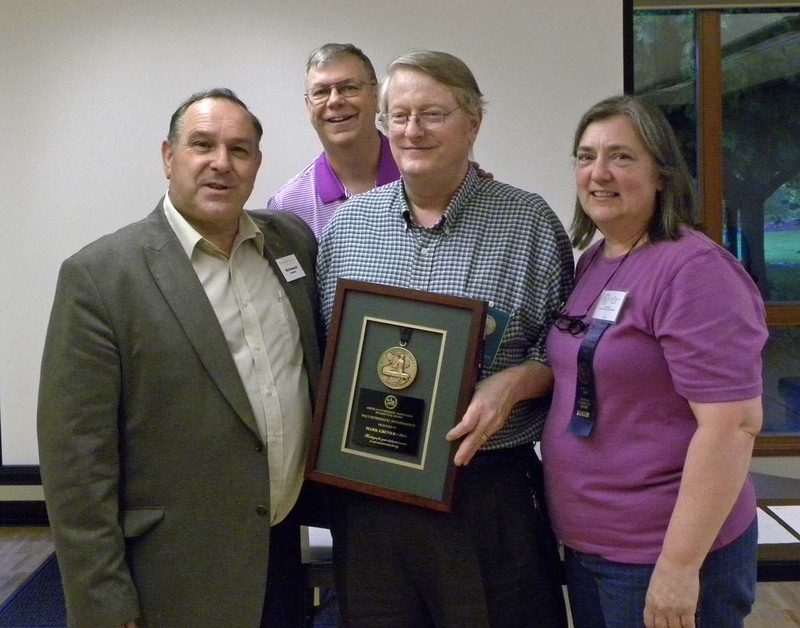 The Nina Nystrom Memorial Numismatic Goodwill Ambassador Award honor went to James Free, while the PNNA’s highest honor, the Bob Everett Memorial Award, was bestowed upon Bill McKivor, a longtime service-oriented board member, for years of unparalleled dedication to numismatics in the Pacific Northwest, as well as integrity as a numismatic dealer. Bill was a close personal friend of the late Bob Everett, and was honored to receive the award. The ending highlight of the awards ceremony was the presentation of two ANA Presidential Awards by President Ostromecki. He recognized two longtime and ‘giving -spirited hobby workers’ within the Pacific Northwest region, Dennis Reed, of the Olympia Coin Club (Olympia, Wash.) and Mark Gruner of Sandpoint, Idaho. 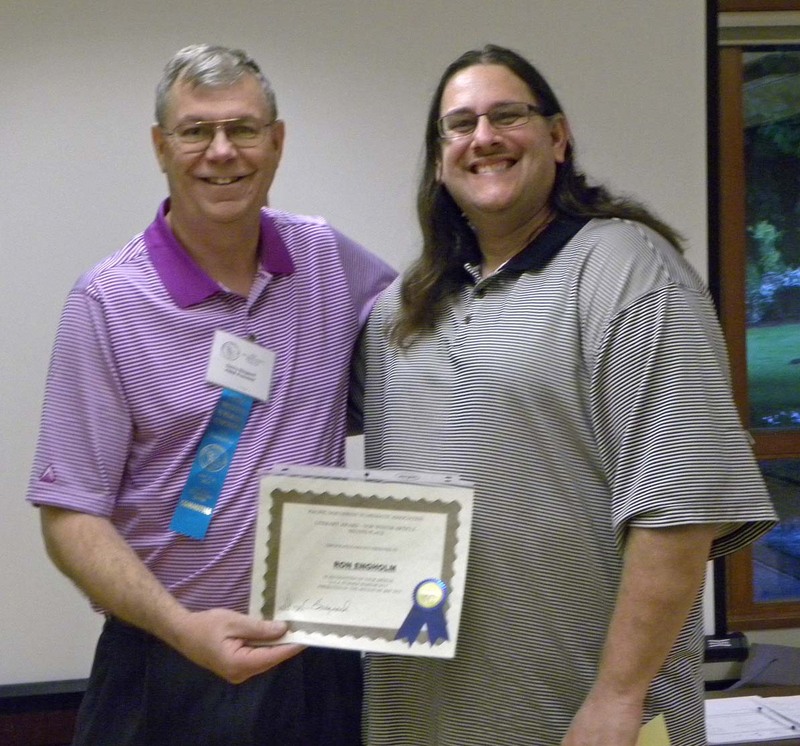 Ostromecki also feted Rick Schulz with one of his coveted ‘Points of Numismatic Light Program’ awards. 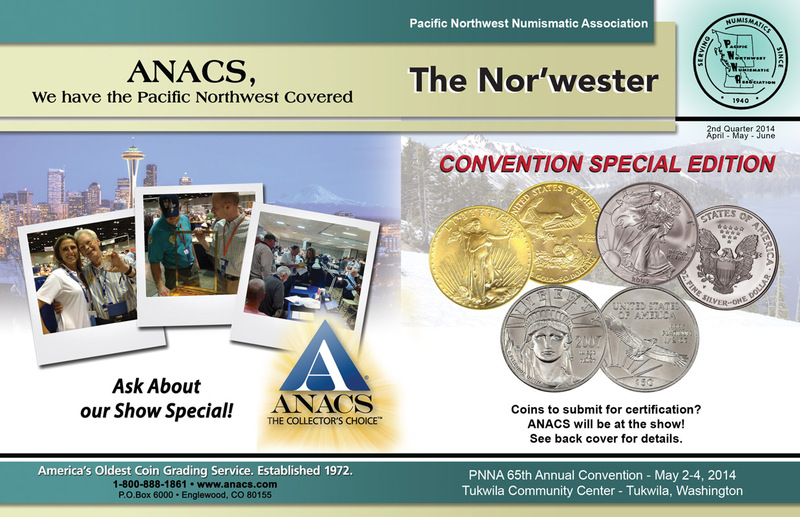 For information about the 2015 PNNA spring show, or to purchase the PNNA-Willamette Coin Club medals for the upcoming March 5-7, 2015 ANA NMS show at the Oregon Convention Center in Portland, visit: pnna.org. (Medals sale information to be added soon.) For bourse information, contact Scott Loos at: scottloos@msn.com.